Imagine, Design and Draw Your Own Characters! 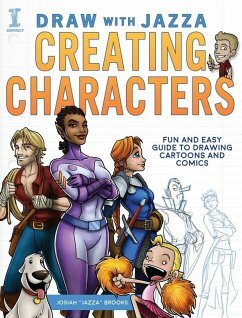 Draw With Jazza YouTube star Josiah Brooks breaks down an easy-to-follow method that will help you to invent and draw original characters time and time again. 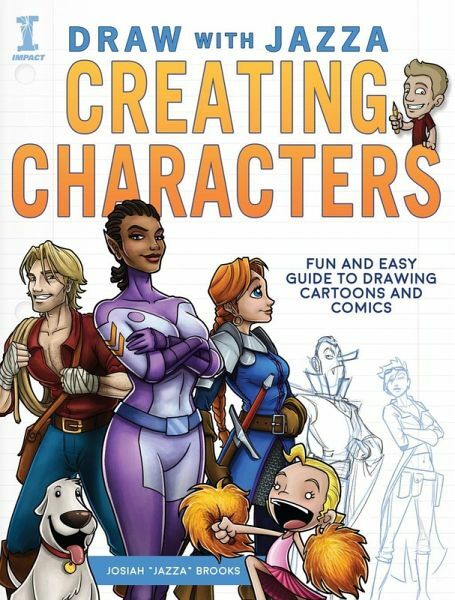 Whether sci-fi or steampunk, comic book heroines or tattooed action heroes, animal familiars or alien races, you will discover the limitless possibilities of creating your very own characters for comic books, cartoons, video games and more! No matter what your skill level, you can draw from concept to finished art with confidence. Jazza shows you how as he walks you through The Design Process!Discover. Learn techniques just like the pros use for developing characters--their backstory, personality and physicality; decide your drawing style; and explore and organize your inspiration.Design. Use brainstorm sketching to refine your character's persona. Use simplified lines and shapes to draw men and women, practice poses and play with body shapes, sizes, ages and outfits.Develop. Refine your best ideas by choosing features, color schemes, settings and context to reflect your end goal.Deliver. Finish your concept art with character turnarounds, expression sheets, pose variations and more to create a complete picture of your characters and their world. Josiah "Jazza" Brooks is an artist and animator best known for the educational and entertainment content on his YouTube channel Draw with Jazza. In 2012, Josiah created his channel to share his self-taught techniques for character design, illustration and animation, and the channel grew rapidly in popularity. As his community grew, he began producing stand-alone educational content and artist resources for his website, www.jazzastudios.com.